With 11 years of photographing weddings under my belt, I consider myself somewhat of an expert when it comes to weddings. I’ve seen all kinds of trends as well as beautiful, unique elements from both ends of the spectrum. One-of-a-kind ideas are always welcome to me as a photographer to help keep things fresh and keep me on my toes. Many brides want to stay with classic tones and themes though so that their wedding and the photos and videos of it will stand the test of time. I thought I’d share today some of the current wedding trends that I’ve noticed myself either at real weddings I have photographed or via Pinterest and social media. Many people start by looking at the Pantone Color of the Year, which this year happens to be “greenery,” a bright, almost apple green color that translates well to weddings obviously through greenery in the floral arrangements, but maybe less obviously in the outdoor photos. I take nearly all of my couples outside for a portion of the day and in the warm months of the year, the greenery shows up in the form of grass, ivy, and sometimes weeds in the background of my photos. 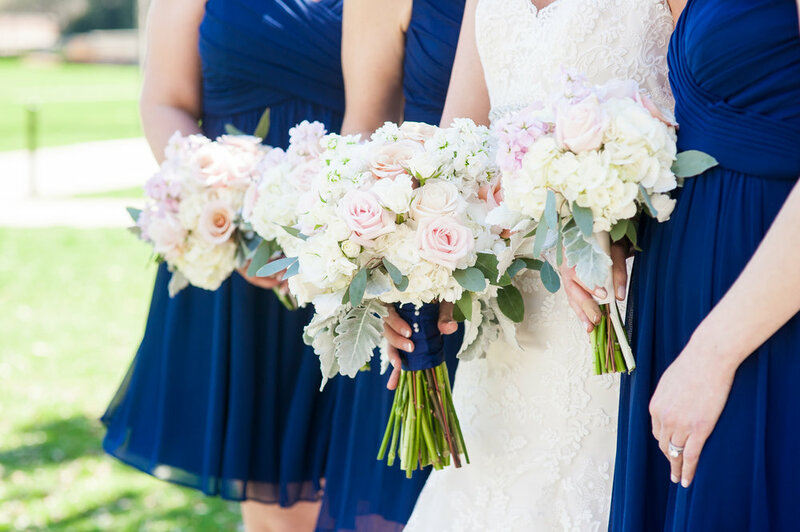 Other colors that are still very prevalent in the wedding industry currently are blush/light pink, navy, gold (and other warm metallics like bronze and copper). Blush is a neat trend because while it is trendy, it is also a neutral and a classic that is timeless. It works very well in flowers and usually works well for bridesmaid dresses as well. When it comes to attire, it is definitely more common to see navy and gray suits now as opposed to stark black tuxes, though black tuxes will never go out of style and are essential to high-end, black tie affairs. And both bridal gowns and bridesmaid dresses are using more plunging, necklines, backless designs, and cutouts. Mismatched bridesmaid dresses are gaining popularity, and I’ve been seeing more metallic in bridesmaids as well. Couples are also opting to go digital more often and sending save-the-dates, and sometimes even invitations and RSVPs via the internet. Reasons for doing so include conservation efforts (less paper! ), possibly more economical, and ease of record-keeping and spreadsheets. Many wedding couples opt for a website now with information for their guests — how they met, photos of the couple, things to do the weekend of the wedding, a schedule, directions, and registry info. Next we’ll move on to reception and celebration trends! There are a ton of cool things happening in the wedding industry right now, and I definitely have a few favorites! First is signature drinks. Pear Tree Estate is big on this and especially with open bar receptions, they will have a little sign at each bar listing “his & hers & theirs” drink options. This is fun because it gives the ladies a more girly or fruity drink to enjoy and the guys get something a little stronger and manly. Moscow mules are really big right now and there are tons of variations on them so they are very versatile. Plus, they are served in a copper mug! Win win! Most of my weddings still have a large tiered cake, or at least a small tiered cake for the couple to cut and save the top tier (for the first anniversary). More and more though, I am seeing dessert bars with any sweets you can think of — pie, brownies, cookies, tarts, cheesecake bites, donuts, macarons, etc. I myself am a cake lover, but I never met a bit of sugar that I didn’t like!! Another fun addition to this is a hot drink bar for fall weddings — hot chocolate and cider with mix-ins like caramel sauce, peppermint, infused simple syrup, marshmallows and more. In addition to the dessert options, I sometimes also see a “late-night snack” option. These have ranged from Curtis Orchard donuts and apple cider to a popcorn bar to s’mores bars to pizza to grilled cheese. And though I haven’t actually seen one in person yet, I CANNOT WAIT to see one of these new DONUT WALLS! WHAT?! A wall of donuts?! Sign me up! Occasionally I also see lounge areas which have become more popular over the past year or so. These are usually set a bit away from the dance floor or even outside on a patio where the guests can go to relax a bit or cool off and have a quiet place to chat. Vendors like Something Old Event Rentals can hook you up with vintage or funky or modern couches and seating, plus rugs, end tables and coffee tables to make your lounge space super cozy and inviting. Lastly, one of the things that really brings the whole reception space together for me is the lighting. I am a huge fan of warm uplighting (or downlighting!) to add a ton of color to your space (even if it’s just amber, it will make a HUGE difference in the aesthetic and photos). I also love any time that twinkle or Christmas lights can be incorporated, but bonus points if they are cafe lights or Edison bulbs to give you that statement look and bit of extra oomph to the lighting. For more rustic or vintage weddings, marquee signs with your names or initials are an additional way to make a visual statement and complete your look or theme. I hope you’ve enjoyed this post and gotten a few ideas for your own wedding. Any questions? I’m happy to help with finding past photo examples from other weddings or recommending vendors who can make your wedding vision a reality. Happy planning! !